We’ve had a bit of a cold snap in Portland lately. Templeton often seeks out warm places to sleep even during normal winter temperatures, so before Christmas my wife bought him a little bed that has an electric warmer built into the bottom. It warms up when the cat lies down, which seemed like the perfect thing for a sleepy cat. Only problem was, Templeton wouldn’t go in it. Scout seems to think it of the devil and won’t have anything to do with it whereas Templeton just didn’t seem that interested. I promised my wife that I could get him to use it in a few weeks. She washed the cover just in case it had a smell they didn’t like. Ladies and gentlemen of the jury, I present you with exhibit A: Templeton zonked out in his new bed. He’s all curled up now beside me and snoring a little bit so hopefully he will continue to enjoy his new bed. On the plus side, if he sleeps here instead of my chairs, maybe it will avoid little incidents like I had today where I came home from a visit to Ridgefield and promptly sat down in a hairball he hacked up while I was gone. 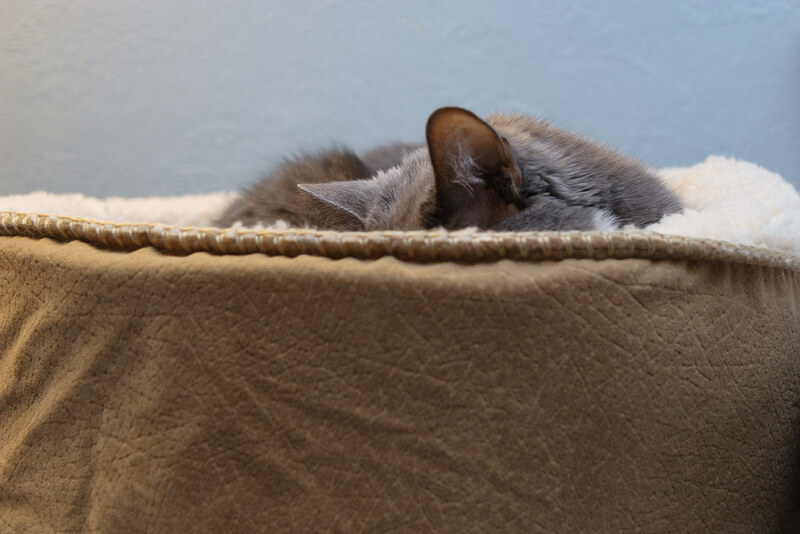 This entry was posted in Pets and tagged cat, cat bed, gray tuxedo cat, sleeping, Templeton. Bookmark the permalink. however, now that he has recognized the Best Bed Ever, he has even more reason to be sure to deposit his hairballs in your chair.